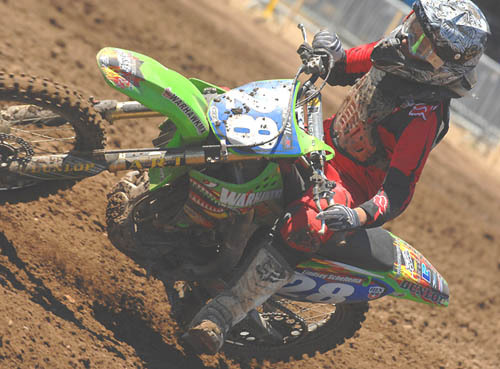 2010 WMX Womens Motocross Round 4 Race Report: Redbud!!! REDDDDDDDDD BUDDDDDDDD!!!!! It’s still ringing in my ears.. This national is known throughout the whole country. I’ll go to other nationals and hear one or two “reddd budddd” shout outs even though were halfway across the country. I don’t know if it’s because Red Bud falls on a national holiday, or if it’s just a big deal- but the fans definitely get riled up and rowdy. If any of you have not experienced a “red bud” experience, I definitely suggest you put that on your “to do” list for 2011. 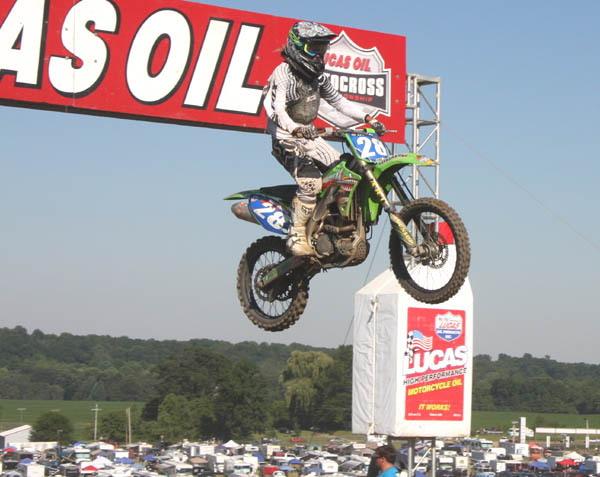 The Red Bud national has always been a big deal for me and I have been going to watch and racing the amateur day there for years. Red Bud is not only my home track, but has been my favorite track for quite some years now. When the 2010 WMX schedule was released earlier this year, I was absolutely speechless when I read the RED BUD was on our schedule! This is the first time in history a women’s national was going to be racing at red bud- I have been waiting years for this to finally happen, and this was my year! I was invited to ride the media ride day on Thursday, what a perfect way to spend my afternoon! We did some interviews with news reporters first, then were released onto the track for a good amount of riding time! The track was perfectly groomed and couldn’t have flowed more nicely. It was fun watching amateur racing. On Friday and Saturday night they had racing on the Night track, and Friday afternoon and Sunday they did amateur racing on the pro track. This is a relatively larger local race because racers love taking advantage of riding on the entire pro track. The whole weekend I was feeling a mixture or extreme excitement along with extreme nervousness. It didn’t even feel like a pro national, just because I race there a lot on the local level, so I think that took some of the added pressure off. My first practice was horrible; I couldn’t put any fast laps down, and the track was still really deep and wet. Crashing a couple of times probably didn’t help either. I walked away from first practice was the slowest lap time. Second practice, I was ready for revenge. I got off first and set a good pace for myself. I ended up getting 6th fastest lap time that session- best to date this season too! I felt really good, a lot more confident, and ready to race. First moto, I got off to a top 10 start and was charging hard. Things were looking good for me…until I slid out. I kept it running; jumped back on and probably only lost a position or 2. I kept charging, until a lap later when I hit a stake and flipped head over handlebars off the track. Amazingly, my bike stayed running, and I got back on and charged back to a 13th place finish. Second moto, it was looking as though I would get a decent mid pack start, when I get taken out and flip off my bike into someone’s moving tire. I jump up, collect my bearings, and start charging towards the pack. I was 28th by the time I crashed the finish line the first lap, but that sure did not stop me. The race continued on, and I’m still catching girls and gaining positions. I got back up to 18th with 2 laps to go when I went off the track into a sand wall. I don’t know how it happened, what I did, or why my bike decided to die- but all of the above took place and I was very angry. After I wearily dug my bike out of the sand and pushed it to where I could start it, I was drained. I kicked my bike and tried starting it for what seemed like forever. By this time my arm was burning in pain from all the sweat dripping onto the fresh wound. I got my bike started, finished the race and rode back to the trailer. I was extremely upset about this weekend, I set very high expectations for myself, and I did not even come close to achieving them. I felt as if I rode the best I have all season at Red Bud, but I crashed more than I have all season just at this one race. I ended up with 16th overall from the day of racing. I am moving on from this experience, and hopefully will take my anger out at Millville. On Sunday I stayed and watched amateur day, I was planning on racing, but I could barely walk, so I knew racing should be out of the question too. I interviewed the overall winners of the day; which was a lot of fun to catch up with some local racers I ride with and know. It was a hot day, but certainly a lot of fun! 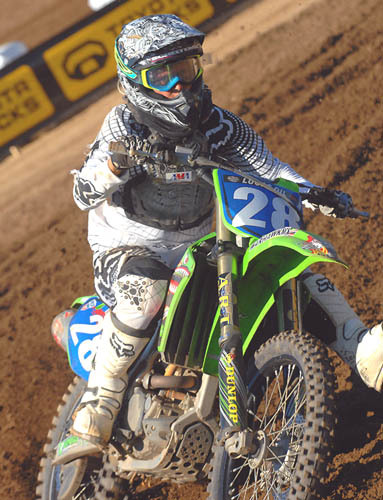 I’m really excited for this weekend off; hopefully get some relaxation in, and some motos in somewhere. Millville is next weekend- another new WMX national; hopefully it goes a little better!! As always, I wouldn’t be able to do this on my own and I have to thank my family, Burrito, the Fitch family, Fox, Smith, Dunlop and everyone else who helps me out- every little bit counts and I appreciate it SO much!